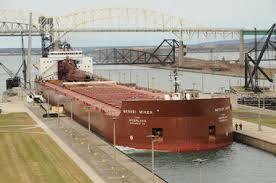 OTTAWA, Ontario, Jan. 14, 2015—A new study released today reveals that $7 billion is being spent on asset renewal and infrastructure improvements in the bi-national Great Lakes-St. Lawrence shipping system. The investment survey, compiled by maritime trade consultants, Martin Associates, tallies US$ 6.9 billion in capital spending on ships, ports and terminals and waterway infrastructure. More than $4.7 billion has been invested in the navigation system from 2009-2013 and another $2.2 billion is committed to improvements from 2014-2018. Two-thirds of the capital (67%) was invested by private companies with 33% coming from government funding. Amongst the most significant investments, American, Canadian and international ship owners are spending $4 billion on renewing Great Lakes-St. Lawrence fleets. Ports and terminals are also collectively investing more than $1.7 billion. The bi-national Chamber of Marine Commerce, one of the trade associations that commissioned the survey, adds that the right regulatory climate has been key for the flurry of capital expenditures, citing New York State’s decision to not move ahead with unachievable standards for ballast water treatment systems, as a prime example. canada economy infrastructure investment shipping trade u.s.